It happened 30 years ago. In November 1977 a group of completely unknown artists in Kyiv organized an exhibit in a building that now houses the Modern Art Center and the Dakh Theater. They were members of the Rukh underground association. They named it so because they felt demoralized during the period of stagnation and decided to counteract it with a movement in art (rukh means “movement”; its name has nothing to do with the identically-named Ukrainian political party). I also took part in this exhibit. I remember this event, which resembled a huge buzzing beehive: grand emotions, shrieks of delight and outrage, silent fear, and the high tensions stemming from the act of resisting the official party-controlled art. Art historians have not made a full and detailed study of underground art in Ukraine, although much has been done in this field by such Ukrainian scholars as H. Vysheslavsky, H. Skliarenko, T. Basanets, Ye. Dymshyts, as well as such foreign researchers of totalitarian culture as I. Golomshtok, B. Groys, H. Arendt, and others. Their works help us spot general trends in the processes that were taking place in world and Ukrainian culture. Whereas the revolt of the shistdesiatnyky (“Sixtiers”), which was unambiguous resistance to official Soviet culture, had the nature of a dissident movement and was severely persecuted by the authorities, by the 1970s and 1980s this resistance had lost some of its force. The power of the authorities was also not as strong as before. The world outlook of free- thinking men of the arts had also changed; now they looked in “permitted” places, and this quest increasingly smoothed over the rough edges of confrontation between underground and official art. The informal art scene in Ukraine in those decades can be described as quiet resistance. During the same period in Ukraine, when our country was part of the totalitarian USSR, there was a conspicuous division between officially recognized, prosperous artists who were in power and the stratum of poor but free artistic circles that did not want to have anything to do with the former. However, there was no demonstrative indignation, no signs of political struggle — simply dedication to culture as a typical reaction of the “quiet Ukrainian” of that period. Indeed, like rare birds, these wonderfully talented young people flew off to different parts of the world. Some were destined to live a short but eventful life, while others continued along the road they had embarked upon in their youth. Almost all the club’s organizers were involved in the scientific and technological sphere. The club’s president, Fedorinchyk, was a graduate of Moscow’s Physics and Technology Institute. He showed a talent for organizing while he was still a student, and he was interested in everything unconventional. 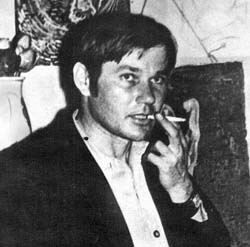 He organized meetings with the science fiction-writing pair, the Strugatsky brothers, and Makarevych’s pop group Mashina Vremeni. Fedorinchyk is still active in the public domain as the head of the Green World Information Center at the Ukrainian Ecological Association. Another noteworthy Rukh organizer was the photographer Yurii Kosin, the creator of excellent albums about Ukraine, whose exhibits are well known in many countries. He finally decided to devote himself to art after taking part in the 1977 show. At the time he was a scientist specializing in cybernetics. Although he was not showing his photographs, he seized every opportunity to be close to things of beauty, including making slides of works by Salvador Dali, who was frowned upon by the Soviet authorities, or arranging exhibit halls for his artist friends. The cyberneticist Mykola Nedzelsky staged his first video shows with synthesized music, graphics, and lighting effects. He too dedicated his life to art. Today he continues to experiment with various media and writes interesting texts. As a lecturer on photography, he has raised a new generation of contemporary art photographers. The dull and official atmosphere at the Art Academy was not favorable to the inception of an avant-garde, but nature abhors a vacuum. Nevertheless, the innovative creative environment attracted some graduates of art colleges. Among the participants of the 1977 exhibit was Oleksandr Kostetsky, t he son of the well-known academician and socialist realist artist, who created the touching painting Return from the Front. His son, having achieved artistic mastery, immersed himself along with his paints in a dreamworld, far removed from the detestable stagnation of the Soviet reality. 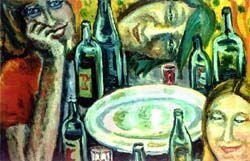 The professionally educated artist Mykola Zalevsky also took part in the 1977 exhibit, where he displayed his work Somehow at Night in which a naked woman is playing with a dwarf on a children’s swing in the dirty green doorway of a Stalinist high-rise building. His surrealistic composition was one of the first canvases with profoundly philosophical content. He has continued to work on these types of works after immigrating to the US in 1991. He visits his native city every year and dedicates his paintings to it. In 2006 Zalevsky’s retrospective show was held in Kyiv. It vividly demonstrated the creative summits he has reached and how much his creativity is permeated with the spirit of modern Ukraine. The works of Mykhailo Zhukov also attracted attention with their mastery and unusual combination of plane and three-dimensional techniques. His striking paintings reflected the hippies’ pacifist moods and portrayed stunning intellectual labyrinths. He continued working in this vein and won international acclaim. In Kyiv his works are on permanent display at the Nef Art Gallery. The painter Volodymyr Bohuslavsky, who lives in Lviv today, continues to work prolifically. Among the many commercial works that were shown at this year’s Fair 2007 at the Ukrainian Home, Bohuslavsky’s eye- catching paintings emanate a powerful creative energy. All the artists who were affiliated with Rukh steadfastly rejected the official ideology with its corrupt art, although various artists compromised to one degree or another. The most radical stand was taken by those who refused to enroll in the Art Academy on principle. Art critics contemptuously referred to them as “auto-didacts,” relegating them to the category of amateurs. Clearly, they did not understand that what they were seeing was a genuine underground. Such spectacular figures of the Ukrainian underground as Mykola Trehub and Vudon Baklytsky were very pained by their conflict with a homeland that refused to recognize their innovative art. Trehub eventually committed suicide in 1984 and Baklytsky died in 1992. In 1977, these two brothers in the art underground made sketches on the streets of Kyiv and exhibited a considerable number of their works, which were marked by expressive colors and extraordinary deformed shapes. Justifying their official non-recognition, they referred to Van Gogh’s zealousness. Today part of their creative legacy is on display at the National Art Museum of Ukraine, Zimmerli Art Museum in New Jersey, etc. Oleksandr Yeremenko, an extraordinary personality, who inspired Belenky to take up writing, died in 2006. The following is an incomplete list of those who took part in that art exhibit 30 years ago: Vudon Baklytsky, Volodymyr Bohuslavsky, Olena Holub, Volodymyr Danchenko, Oleksandr Yeremenko, Mykhailo Zhukov, Mykola Zalevsky, Oleksandr Kostetsky, Volodymyr Lehastov, Mykola Nedzelsky, Oleksandr Polishchuk (sculptures), and Mykola Trehub. Among the works on display were chance ones by artists, who eventually abandoned their creative work. Lehastov took up psychology, and Danchenko started writing articles about psychoregulation, yoga as a discipline, and the specific features of the tasks of art in the context of various levels of consciousness. The main thing is that the democratic approach of this artistic organization, which allowed its members to put anything on display (no censorship! ), created a special atmosphere of freedom. All those who were involved in the 1977 project would keep this light in their hearts and exert a charismatic influence on events in Ukraine and the international scene. The activity of the Rukh association, which emerged spontaneously, stopped functioning because of a large number of factors. The last exhibit was on a considerably smaller scale than the first one and occupied only one room at the House of Scientists in 1978. During the several years of its existence Rukh held shows, disputes, and seminars on various spheres of cultures, drawing people who gathered to discuss new books, films, etc. Eventually, the film club broke away, and the artists regrouped or immersed themselves deeply in creative work. The organizers found it increasingly difficult to function after the Moscow-based journalist Bossart wrote a devastating article that was published in the central press. At the time it carried a lot of weight. In a country where everyone unquestioningly had to march toward a single goal, anything else was branded as unworthy of existing. Every newspaper made a point of ridiculing the “idealess artists.” In 1978, that journalist handed down her verdict: “Playing at a movement in [Kyiv] produces nothing but inertness because there is no movement!” But, as we can see, history proved differently.